The highly anticipated lightweight title fight between UFC champion Frankie Edgar and No. 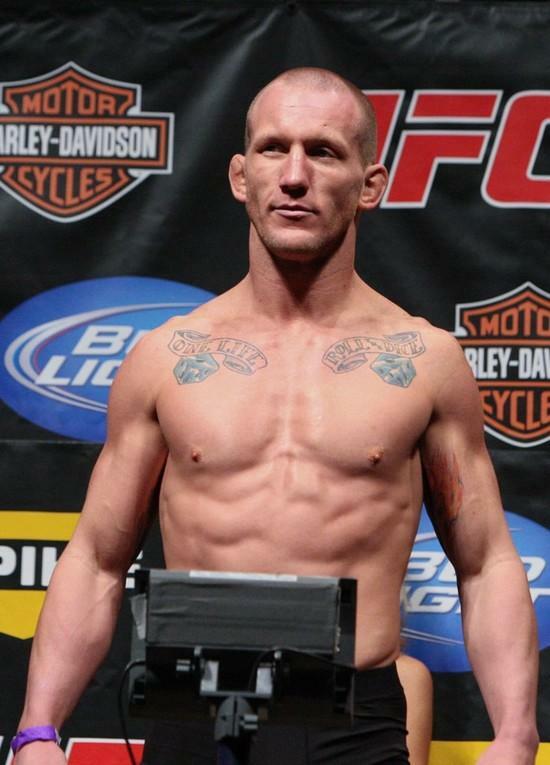 1 contender Gray Maynard is officially off, as both fighters suffered injuries during training camp. The matchup, which was scheduled to headline the UFC 130 event on May 28 in Las Vegas, was to be the third meeting between Edgar and Maynard. They fought to a split draw in the main event at UFC 125 on Jan. 1. Maynard defeated Edgar by unanimous decision at a UFC Fight Night event in April 2008. It is currently unknown how long each fighter will remain out of action. “[Edgar] was looking phenomenal,” Henry said. “We probably had the best [training] we ever had and his back blew out. About two weeks ago his back blew out and we didn’t train for a week. He felt a little better the next week but the back was still messing up. According to Maynard’s camp, the challenger’s knee began bothering him several weeks ago, at which point he contacted and visited UFC physicians. At that time, Maynard, who’s dealt with nagging knee injuries in the past, decided to proceed with the fight. About 10 days ago, Maynard suffered a facial cut during practice. Again, he refused to withdraw from the fight. Martinez says the fight will now likely be pushed back as far as September, as the UFC’s schedule is already full regarding main events through that date. The UFC also confirmed a light heavyweight bout between Quinton Jackson and Matt Hamill will now headline the May event. In addition, a welterweight fight between Thiago Alves and Rick Story will fill out the night’s pay-per-view card. Brett Okamoto covers MMA for ESPN.com. Xtreme Couture fighter Gray “The Bully” Maynard talks with Dave Farra about his feelings on the fight. Maynard also discusses the emotions he felt when it was announced the UFC first intended to give Anthony Pettis the next title shot, and the moment that Dana White changed his mind. An old matchup becomes new again, but this time a UFC title is on the line. As was previously expected, UFC lightweight champion Frankie Edgar (13-1 MMA, 8-1 UFC) will defend his title against undefeated challenger Gray Maynard (10-0 MMA, 8-0 UFC) at UFC 125. While not officially announced by the organization, UFC 125 is expected to take place Jan. 1 at the MGM Grand Garden Arena in Las Vegas and air on pay-per-view. MMAjunkie.com (www.mmajunkie.com) confirmed that verbal agreements are in place for the contest, which was first reported by MMAFighting.com. Edgar and Maynard, of course, met once before, and it was the current challenger who came out on top. It was Maynard who handed Edgar his lone career defeat in an April 2008 bout at UFC Fight Night 13. However, Edgar bounced back with a pair of decision wins over Hermes Franca and Sean Sherk, as well as a submission win over Matt Veach, and was awarded a title shot against then-champion B.J. Penn. Despite seemingly insurmountable odds against him, Edgar defeated Penn in a hotly contested UFC 112 decision. In August, Edgar solidified the legitimacy of his title by again defeating Penn, though it came in even more dominating fashion the second time around. Meanwhile, Maynard followed up his win over Edgar with a five-straight decision victories over a murderers’ row of opponents in Rich Clementi, Jim Miller, Roger Huerta, Nate Diaz and Kenny Florian. Despite the wins, Maynard was passed over in favor of Edgar for the first shot at the belt. Additionally, MMAjunkie.com has learned that with the Edgar-Maynard booking, a middleweight title fight between champion Anderson Silva and challenger Vitor Belfort will likely take place at the UFC’s annual Super Bowl card. UFC officials had targeted the matchup for Jan. 1, but the champion reportedly asked for the delay in order to fully heal the aching ribs that affected him in the days leading up to his now-legendary UFC 117 contest with Chael Sonnen. Two-time number one lightweight contender Kenny Florian will indeed collide with Xtreme Couture MMA‘s fighter Gray Maynard (9-0) at UFC 118, which is tentatively scheduled for the TD Garden in Boston, Mass., on Aug. 28. Florian has been to the mountain top twice before. First against Sean Sherk in a five round unanimous decision loss at UFC 64 in 2006 and then most recently at UFC 101 in 2009 when he was choked out by ex-champ BJ Penn in Philadelphia. Like Florian, Maynard has been a handful for the lightweight division since graduating the fifth season of The Ultimate Fighter (TUF). “The Bully” is perfect through nine fights and even has a unanimous decision win over current champion Frankie Edgar. It’s likely that the winner of this contest will be next in line for a shot at the crown — but will it be against “The Prodigy” or “The Answer?” Time will tell. UFC Fan Expo & UFC 114 Weekend ! ! MMA skills and strength and conditioning. The Xtreme Camp is open to people of all skill levels. He’s nicknamed is “The Bully” but he’s really a pussycat outside of the cage. For that reason, even Gray Maynard knows he’s probably screwed when it comes to getting the first shot at Frank Edgar’s UFC lightweight title. B.J. Penn released a video Tuesday saying the promotion had already called to say they were working on a rematch. Meanwhile fans are scratching their heads saying, “Wait, Penn just lost, Maynard is unbeaten with a win over Edgar, why isn’t he getting the shot?” Maynard knows why. Maynard said it started to dawn on him at the start of 2010 as a potential Penn title fight developed on the horizon. That shot was between himself and Edgar. Maynard now says he needed to be a lot more aggressive with the media andthe promotion before his fight against Nate Diaz. But Maynard didn’t want to look ahead and didn’t want to get down on his knees and beg for his shot. “I needed to be out there saying, ‘I want Penn, I want Penn, I want Penn,” admits Maynard. Maynard won a decision but in the postfight, he and his mentor Randy Couture chose to take a grounded approach toward a Penn fight and didn’t want to call him out. Dana White responded a few days later saying he wasn’t sold on Maynard and Edgar would get the next crack. Maynard did step it up a bit this week immediately doing several interviews after UFC 112, texting UFC matchmaker Joe Silva and going on Twitter but Maynard said he hadn’t really laid the groundwork the last few years to grab that title shot. A more aggressive approach right after his win against Diaz in January at Ultimate Fight Night 20 could’ve paid dividends this week. It was surprising to hear Maynard and mentor Couture take a laid back approach. It’s lesson learned for both of Xtreme Couture’s top level lightweights, Maynard and Tyson Griffin. You may not like or be comfortable with what guys like Chael Sonnen, Dan Hardy, Josh Koscheck and the Diaz Brothers do as far as calling out opponents and dishing some dirt, but it’s a necessary evil to push yourself forward. It is the fight business and sometimes matching up two nice guys is bad for business. Maynard said it started to dawn on him at the start of 2010 as a potential Penn title fight developed on the horizon. That shot was between himself and Edgar. Maynard now says he needed to be a lot more aggressive with the media and the promotion before his fight against Nate Diaz. But Maynard didn’t want to look ahead and didn’t want to get down on his knees and beg for his shot.